Here is your end-of-the-month Fantasy Basketball Pros Injury Report. Recently the NBA has lost Yao Ming and Daniel Gibson to devastating injuries. The good thing about injuries (sorry to those that are actually injured) is that it makes fantasy a lot more volatile and fun. If you’re thinking about picking someone up, consider a player from a banged up team like Portland or Washington. Didn’t go on the last road trip. Apparently he is resting instead of rehabbing. UPDATE 2/28–apparently Butler has a tear in his hip and it’s very unclear what his timetable for return will be. Agent Zero played a full-court one-on-one against rookie Nick Young before Washington’s game vs. Charlotte on Feb 23. His left knee is gaining strength, but he backed off his earlier target of returning against New Orleans this Sunday. Claims he can jump as high as he could before he was injured. Will resume full-contact practice in the near future. Expected fantasy impact upon return: Don’t expect much. The Clips are almost certainly out of the playoff hunt and they’ll be looking for a good lottery pick and a healthy Brand for next year. His minutes will be severely limited. For more injury updates, subscribe to Fantasy Basketball Pros’ RSS feed! Yao Ming is reportedly out for the rest of the NBA season with a stress fracture in his left foot, a move that will inevitably cause the Houston Rockets to miss the playoffs and kill some fantasy teams who will be without their first round pick for the playoffs. 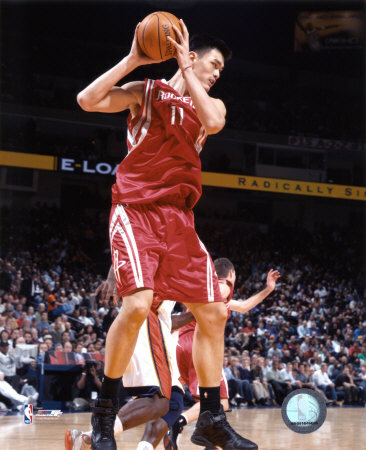 Yao was one of the top 10 players in fantasy basketball, averaging 22 points/game and almost 11 rebounds/game while adding 2 blocks/game and great shooting percentages. Apparently this is the type of injury that is impossible to play with, and team doctors decided it would be best to shut him down for the rest of the year. Houston, which has been on a 12-game winning streak and sits at the 7th spot in the West but only 3 games back of the Lakers for first, now apparently has a great chance of missing the playoffs. This is good news for Golden State, Denver, and Portland, which sit at 8th, 9th, and 10th right now in the West. The fantasy impact for Yao owners is detrimental. Losing a first round pick and a solid contributor in the middle of a playoff run is never good. However, these teams need to keep their heads and look to fill these holes. Luis Scola and Carl Landry, who had been seeing time in the Rockets rotation recently, now look like solid pickups (Scola especially) if they are available in your league. Scola may be forced into Yao’s starting spot and has shown that he can score and rebound, while Landry becomes the first big man off the bench. Let us know in the comments below whether you think the Rockets (who have a easier-than-normal schedule the rest of the way) will still make the playoffs in Yao’s absence. For more breaking news and its fantasy impact, subscribe to Fantasy Basketball Pros’ RSS feed! Aaron Brooks, Houston Rockets – A streaky guard from Oregon, Brooks showed signs of stardom in college but may be too small to make an impact in the NBA. Brooks has been unable to get anything more than garbage minutes for the Rockets this year, but has shown some proficiency in handling the ball and shooting free throws. Still, with the acquisition of Bobby Jackson, it seems that Brooks’s role diminishes even further. Recommendation: Ignore Brooks, consider Jackson if you need 3-point shooting and he is getting solid minutes in a strong rotation. 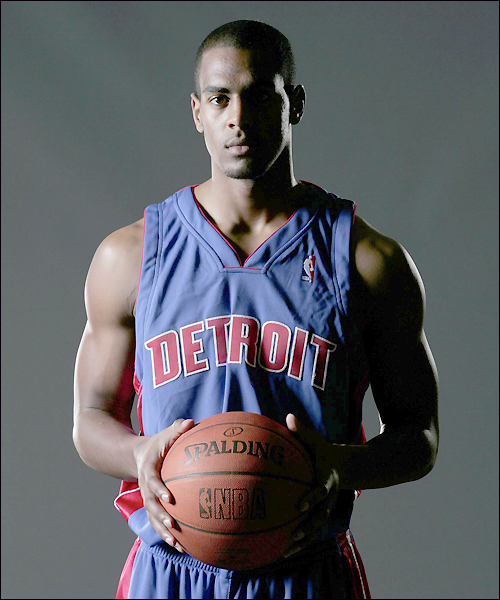 Arron Afflalo, Detroit Pistons – A key cog in the UCLA teams that made two consecutive Final Fours, Afflalo fell to the late first round due to inconsistent shooting and unimpressive physical features. He has battled fellow rookie Rodney Stuckey for minutes, and this has caused both players to have minimal value (unless you can own both players with one roster spot). Afflalo will keep getting about 10-15 minutes/game the rest of the season, but it will not be enough to get you any type of stats. Recommendation: See if the commissioner will allow you to own a combination of Afflalo and Stuckey. Tiago Splitter, San Antonio Spurs – If anyone knows how to draft foreign players, it’s the Spurs, who have picked up Tony Parker and Manu Ginobili in previous drafts and have the best international scouts in the NBA. Is Splitter the next in line of the great international Spurs players? Well, we will not find out until at least 2008, since he is serving out the rest of his contract with TAU Ceramica of the Spanish League. He has great size and raw ability at 22 years old, and if he plays for the Spurs, he can learn from one of the greatest power forwards ever. Recommendation: Keep an eye on him next season. For now, pretend he does not exist. Alando Tucker, Phoenix Suns – A strong contender for the Naismith Award as a senior at Wisconsin, Tucker just did not project well to the NBA since he is 6-6 but plays mostly a post game. He has only played in 5 games with the Suns this year and really does not fit their style well at all, so he has been running in the NBDL. This was really a wasted pick by the Suns: not much upside and the wrong player for the system. Recommendation: Will never make an impact in the NBA, so why would he help your team? Recommendation: Try to get Steve Nash instead. As is normal, the end of the first round produced no players with any impact this year. However, my guess is that Splitter and possibly Koponen will become solid NBA regulars in a few years. Keep an eye on the up-and-coming SF/PF of the Seattle SuperSonics, Mickaël Gelabale. He’s probably not a pickup just yet, but have him on your watch list. Especially if you are in a deeper league/keeper league. Gelabale has been up at Triple-A (the D-league) Idaho working on his game, but watch out for him the second half of this season if you’re in need of points and rebounds. As he showed tonight against the Lakers, this guy can flat out shoot. In 32 minutes (against what has become probably the best team in the league*), Gelabale scored 21 points (10-16) and grabbed 8 boards. 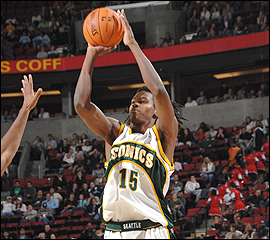 With veteran Kurt Thomas gone from the front court and Kevin Durant’s freshmen year shooting woes continuing (4-13 tonight), the Sonics will be doing a lot of experimenting. Gelabale has always had trouble putting “two halves together” (P.J. Carlesimo), but if he plays like he did tonight and like he did against Portland last Friday (12 points on on 4-6 shooting), he’ll definitely be in the lineup for the Sonics. UPDATE 3-1-08: After the return of Earl Watson to the starting lineup on 2-29, Gelabale only logged 12 minutes, shooting an atrocious 1-8. Expect Ridnour and company to log more minutes and for Gelabale to see less production. Although, I will keep monitoring the Sonics, as they are a very volatile team right now. I had to do some digging to find out that Gelabale was selected by the SuperSonics in the second round (48th overall) in the 2005 NBA Draft but opted to play in the Spanish League that next year before joining the NBA. 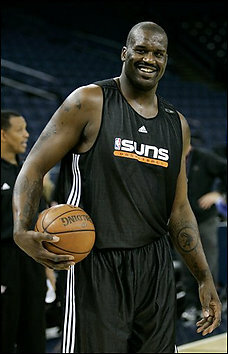 In July of ’06 he officially signed with Sonics. An interesting fact about Gelabale: he’s got some crazy hair, apparently it measures an astounding 47″ around. Also, Kobe was ejected for the first time ever in the Sonics-Lakers game tonight. For more Fantasy Sleepers, subscribe to Fantasy Basketball Pros’ RSS feed. Shaq: Now playing with a chip on his shoulder, not to mention moving from the worst team in the league to one of the best, Shaq is revitalized and should be a solid 2nd center in most leagues. Memphis Grizzlies: This team packed it in early and has decided to rebuild around Rudy Gay and Mike Conley, but can you really tell me that is the best package Pau Gasol could have brought back? 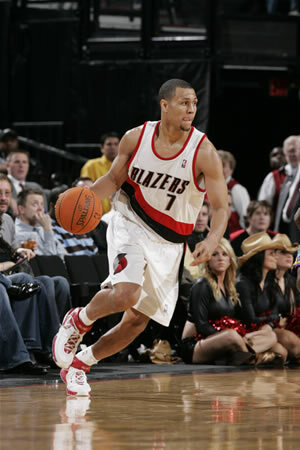 Shawn Marion: I personally think his stats will take a bit of a tumble in Miami without Steve Nash and that system. Not a good move, especially since he is looking for that big contract. Fantasy-owners who took him in the top 3 are now regretting their decision. Western Conference Fringe Teams: If you are the Rockets, Warriors, Blazers, or Nuggets, you cannot like the fact that you essentially could not improve your teams while the top of the West got stronger. Boston Celtics and Detroit Pistons: Sure they can battle it out for the East, but Cleveland may be a bit stronger to contend and how can they expect to win a championship now? Don’t forget to sign up for Fantasy Basketball Pros’ RSS feed! Cleveland GM Danny Ferry finally pulled off a deal to try to appease star Lebron James before the 3 PM deadline, brokering a 3-way deal with Central Division foe Chicago and the Seattle SuperSonics. This surprise has come as a shock to many people. Everyone knew Ferry was looking to deal and try to light a fire under an underachieving Cavs team, but it seems that this was the best deal available. Still, I really do not like the deal for any of the teams. But this deal hinges upon many things. Can Ben Wallace find the motivation to be a standout defender again? Can the new pieces in Cleveland and Chicago gain chemistry to make a playoff push? The fantasy impact seems mostly beneficial for a lot of the players involved. My guess is that Wallace will gain the passion he played with in Detroit now that he is with Lebron James, and will become a rebounding a blocks machine while getting easy baskets due to King James. I think that Szczerbiak is the main winner in the deal. He will get the majority of the open 3-point looks that Lebron causes, especially since Daniel Gibson has had a few injury problems. Pick him up off waivers in your league if he is available! Joe Smith and Drew Gooden should see similar roles and minutes seeing how they really just switched roles. A lot of the Cleveland players may see a bump in fantasy stats, but they lose some perimeter defense in Hughes and Newble and it may actually make them a worse defensive team. 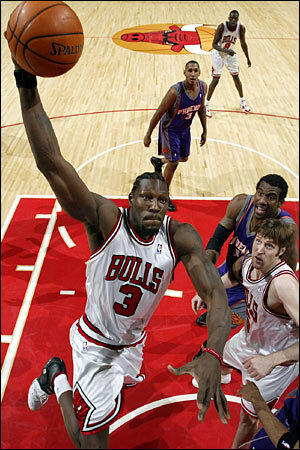 The Bulls had to take in a contract after shipping off the mistake known as Ben Wallace. It turns out to be chronic overachiever Larry Hughes, who will probably see less fantasy value because he becomes congested in the backcourt filled with Ben Gordon, Kirk Hinrich, and Thabo Sefolosha. Each of these players may lose some value due to shared roles. The rest of the players in the deal, except possibly Drew Gooden, who can hopefully become the post presence the Bulls have never had, really have no fantasy value. On Seattle’s end, it really is another white flag, with the shipping off of a few more veterans. Thus, this might be a big splash that does not really have much real impact, fantasy and actual, for any of the teams involved. It might be the case where the grass looks greener on the other side. As a break to all the trade news, we present you with the next installment of RookieWatch 07-08, with picks #21-25 of the 2007 NBA Draft. Don’t forget to check out the fantasy analysis of first round picks #1-20 here: #1-5 | #6-10 | #11-15 | #16-20. Daequan Cook, Miami Heat – The third and least famous member of that Ohio State freshmen class (all with agents Mike Conley, Sr.), Cook surprisingly opted to leave the Buckeyes after one year and joined the Heat as a 3-point specialist with untapped ability. Cook was one of the reasons the Heat let Jason Kapono (the 3-point champion) leave, but he has faltered in his first season, even with adequate playing time. He is shooting under 30% from threes and under 40% overall, although he could help with FT % (over 90%, but does not attempt many). Recently, with the acquisition of Shawn Marion, it seems that Cook has been buried deep on the bench and even with the Heat out of contention in the lowly East, may not see many minutes the rest of the way. Recommendation: Look elsewhere for 3-point shooting help. 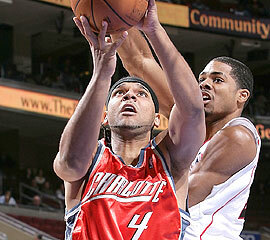 Jared Dudley, Charlotte Bobcats – A four-year player at Boston College, Dudley was an absolute star his senior season, but did not have huge upside and fell to this part of the first round. Dudley has not adapted quickly to the NBA, and with superstud Gerald Wallace ahead of him, struggles to see consistent minutes. Recently, he has been able to score, and if he sees regular action, may actually be able to help in both FG and FT percentage, steals, and rebounds. However, with just about everyone in the thick of a playoff race in the East, Dudley may not get his fair share of minutes down the stretch. Recommendation: Keep an eye on him. Too solid a player to ignore if he gets the minutes. Wilson Chandler, New York Knicks – Leaving DePaul after his sophomore year, Chandler rose into the first round due to his length and athleticism, which made Isaiah Thomas draft him over more established college forwards. So far, Chandler has been unable to break a surprisingly deep Knick rotation. In fact, he has barely played all season. There is no reason to think that will change since Thomas really likes his current rotation (another reason he should be fired as coach). Rudy Fernandez, Phoenix Suns – Fernandez actually had his rights traded to the Portland Trailblazers along with James Jones for cash. He is not expected to play in the NBA until at least the 2008-2009 season, since his contract with Joventut of the Italian League is until 2011 (which means expensive buyout). Recommendation: Pick up if you want to finish in last place. Morris Almond, Utah Jazz – A pure scorer, Almond was truly a wildcard coming into the draft, having played at a weak college school. However, with the emergence of players such as Ronnie Brewer and a midseason trade for Kyle Korver, Almond has not played much this year (has not seen minutes outside practice since early January). Although he has the length that teams love (reminds me a bit of Thabo Sefolosha of my Chicago Bulls in size), he is not developed enough to log minutes during an intense playoff race. So it seems that none of these later first round picks have panned out, which usually happens. But keep an eye on Dudley. I think he will one day turn into a decent NBA player. Keep up with Fantasy Basketball Pros by subscribing to our free RSS feed!